You'll be £19.99 closer to your next £10.00 credit when you purchase Jack the Ripper: Quest for a Killer. What's this? Order within the next 9 hours to get your order processed the next working day! Mad doctors, Russian lunatics, bungling midwives, railway policemen, failed barristers, weird artists, royal princes and white-eyed men. All of these and more have been put in the frame for the Whitechapel murders. Where ingenious invention and conspiracy theories have failed, common sense has floated out of the window. M.J. Trow, in this gripping historical reinvestigation, cuts through the fog of speculation, fantasy and obsession that has concealed the identity of the most famous serial murderer of all time. 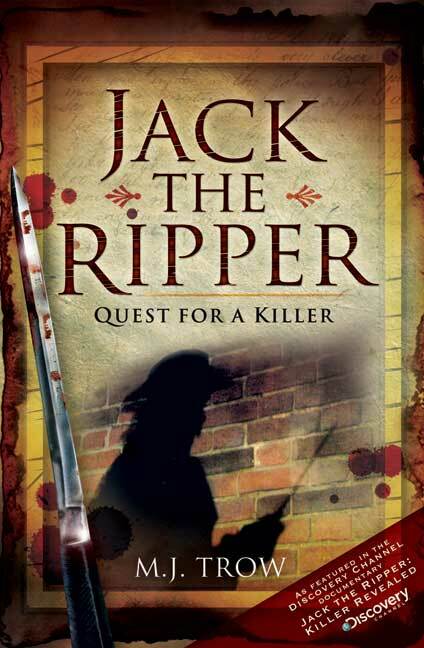 Perhaps the most hunted killer of all time is Jack the Ripper, namely because the identity of the Whitechapel murderer has eluded the best manhunters since the 1880's and has created a cottage industry of speculation and finger pointing. The list of suspects runs the gamut from the royal family of England to lunatics of all stripe and national origin, insane doctors, incompetent midwives, policemen and bad lawyers (or barristers, as they are known in Great Britain). Conspiracy theories abound and interpretation of the facts have crossed over into pure imagination. In Quest for a Killer, Mr. Trow present a rational reexamination of the case,using modern forensic techniques and profiling of the list of known suspects, including a previously unknown one. In doing so, he destroys the conspiracy theories, outlines a new motive for the killings and proves the Ripper killed seven women, not five as everyone is led to believe. His suspect, for which he presents a solid, sane case, is Robert Mann, a Whitechapel resident who worked as a mortuary assistant at the Eagle Place mortuary. Trow's book is an honest one, painstakingly researched and presented, making for a very plausible case. In addition, he presents a painfully accurate picture of what it was like to live in Victorian London, especially the Whitechapel section. This book is for Ripperologists and those interested in the time period.